The Pentax DA series of lenses are designed for the exact specifications of digital sensors so, much like mirrorless lens models, they’re efficiently compact with a smaller imaging circle and, hence, smaller, lighter components. With APS-C crop, the Pentax K-mount currently includes the smc DA 12-24mm ƒ/4 ED AL (IF) lens with 18.5-37mm coverage and a constant aperture. At an equivalent 24-75mm, the smc Pentax DA* series 16-50mm ƒ/2.8 ED AL (IF) SDM zoom is a high-quality pro lens with a quieter SDM focus motor and weather- and dust-resistant construction. They also offer a number of intermediate wide-angles like the 17-70mm ƒ/4, an 18-55mm ƒ/3.5-5.6, a 16-45mm ƒ/4, an 18-135mm ƒ/3.5-5.6 and a 15x zoom with the 18-270mm ƒ/3.5-6.3. The smc DA 10-17mm ƒ/3.5-4.5 ED (IF) fish-eye will zoom out to a more conventional wide-angle view at 100º. List Price: $199 (DA 18-55mm ƒ/3.5-5.6 AL WR); $499 (smc DA 18-135mm ƒ/3.5-5.6 ED AL (IF) DC WR); $599 (smc DA 17-70mm ƒ/4 AL (IF) SDM); $599 (smc DA 18-270mm ƒ/3.5-6.3 ED SDM); $599 (smc DA 16-45mm ƒ/4 ED AL); $649 (smc DA 10-17mm ƒ/3.5-4.5 ED (IF) fish-eye); $899 (smc DA 12-24mm ƒ/4 ED AL (IF)); $1,299 (smc DA* series 16-50mm ƒ/2.8 ED AL (IF) SDM). Samsung’s line of NX mirrorless lenses starts with the new 9-27mm ƒ/3.5-5.6 ED OIS, which is only compatible with the diminutive Samsung NX mini (24-73mm equivalence). For the rest of their APS-C line of NX-system cameras with a 1.54x crop factor, they offer the 12-24mm ƒ/4-5.6 ED and several "standard zooms" that start fairly wide, including the 16-50mm ƒ/3.5-5.6 with 24.6-77mm equivalence, and the more professional version of the same focal length with a brighter variable aperture in the 16-50mm ƒ/2-2.8 S. They also produce the 20-50mm ƒ/3.5-5.6 ED II and the 18-55mm ƒ/3.5-5.6 OIS with Optical Image Stabilization, but at a few hundred dollars more, the much longer 18-200mm ƒ/3.5-6.3 ED OIS might be the better purchase with roughly the same minimum aperture at an equivalence of 27.7-308mm. 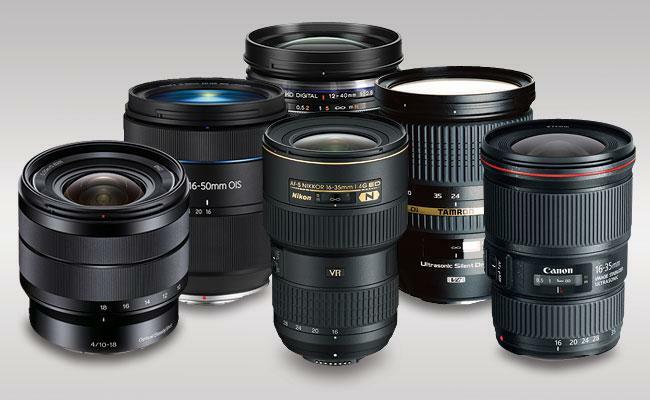 List Price: $219 (20-50mm ƒ/3.5-5.6 ED II); $229 (18-55mm ƒ/3.5-5.6 OIS); $299 (9-27mm ƒ/3.5-5.6 ED OIS); $349 (16-50mm ƒ/3.5-5.6 ED OIS); $559 (12-24mm ƒ/4-5.6 ED); $699 (18-200mm ƒ/3.5-6.3 ED OIS); $1,299 (16-50mm ƒ/2-2.8 S ED OIS). Available in Canon, Nikon, Pentax, Sigma and Sony mounts, Sigma’s wide-angle zooms include the 8-16mm ƒ/4.5-5.6 DC HSM (DC indicates lenses designed for APS-C sensors, which will cause vignetting if used with full-frame cameras), the full-frame 12-24mm ƒ/4.5-5.6 DG HSM II and two 10-20mm zooms for APS-C cameras, one with a constant ƒ/3.5 aperture and the other with a variable ƒ/4-5.6, which is also available for Four Thirds mounts. For a longer reach, they also produce the 18-250mm ƒ/3.5-6.3 DC OS Macro HSM and the 18-200mm ƒ/3.5-6.3 DC OS HSM, which is available with or without macro. List Price: $399 (18-200mm ƒ/3.5-6.3 DC Macro OS HSM | C); $479 (10-20mm ƒ/4-5.6 EX DC HSM); $499 (18-200mm ƒ/3.5-6.3 II DC (OS)* HSM); $549 (18-250mm ƒ/3.5-6.3 DC (OS)* Macro HSM); $649 (10-20mm ƒ/3.5 EX DC HSM); $699 (8-16mm ƒ/4.5-5.6 DC HSM); $949 (12-24mm ƒ/4.5-5.6 DG HSM II). Can you explain why amongst Panasonic’s lenses you also list the 7-14mm zoom but ignore the fact that Olympus also offer an f2.8 7-14mm zoom?